Dragons have never looked this good! Eye-popping visuals make the diverse islands and inhabitants of Dragolandia come to life. Your pets appreciate attention; feed them, cuddle them and care for them to receive extra gold and special bonuses. Never run out of cute, scaly friends with more than 350 unique species you can breed and add to your dragon collection. 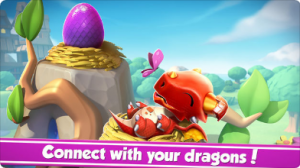 Take your dragons on a journey across the land! Reach higher and higher leagues as your collection and skills improve with each new battle! Seasonal events and special quests are added with each update, so you never run out of things to do. Show ‘em who’s boss! Take on your opponents in the Arena to collect awesome prizes! Be the Clan with a Plan! Use the Clan Chat to devise group strategy, or just discuss what you’ve been up to.